“Stranger” is a great show, but there is a fundamental reason why it stands out — but The New York Times was scared to say it. I didn’t think much when I first learned that “Strangers,” also known as “Secret Forest,” had made it onto the New York Times List of the best international television of 2017. To be completely honest, I hadn’t even watched the show — with so many different dramas coming out each year some just slip past you as you try to balance two to three dramas with work and other responsibilities. Aired simultaneously on tvN and Netflix from June to July this year, “Stranger” centers on Hwang Shi-mok (Cho Seung-Woo), a prosecutor with extraordinary intelligence, and the smart and humane Police Lieutenant Han Yeo-jin (Bae Doona). Together, they work on unraveling a mysterious case that runs deeper and darker than they could have imagined. The show was on my list, and I was planning to eventually watch it sometime in the future. However, a Twitter post made me reconsider my position of indifference pushed it to the top of my watch list. The poster called it a masterpiece and said that the review was lacking. I headed over to the website to have a look for myself and indeed, the review is sorrowfully brief. Compared to the punchy language, pop-culture references, and concise analyses, the review for “Strangers” only has one long sentence. Further, James Poniewozik, Mike Hale and Margaret Lyons, the curators of the list, remarked that the show’s greatness came from having less of the “usual awkwardness and obviousness” of other South Korean dramas. 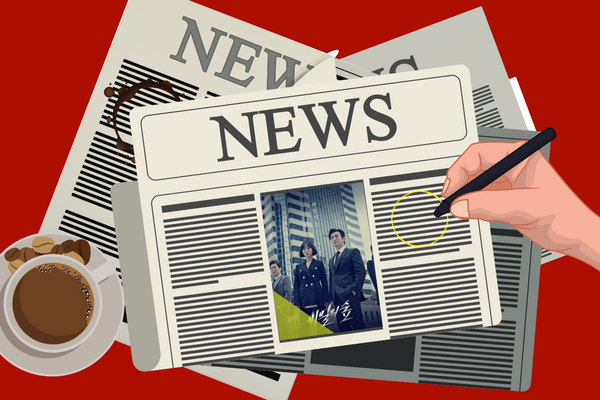 Moreover, they concluded that the show had the advantage of the “immensely likable Bae Doona” as one of the leading characters. I only needed to watch a few episodes of “Stranger” to confirm that the one-sentence-remark was poor. However, in those episodes, I was able to glean some insight into the short review. Although short, the review included two significant points. The first compared the plot and acting in “Stranger” and other South Korean shows. The second focused on Bae Doona and her likability. Sure, Bae Doona is likable, but is that really enough reason to include such a statement in a review seen around the world? No, but it did point to a particularity that the writers felt they couldn’t include, that Bae Doona acts everyone in that show out of the water. In fact, scenes where Bae Doona appeared by herself, had more impact and emotional range and adequately illustrated the nature of her character and level of competence and astuteness as a cop. Conversely, when paired with the main character Hwang Shi-Mok, she becomes frustratingly self-conscious and over-acted as Bae Doona balances the true nature of her character with a lead which by design lacks emotional range. Of course, this is all speculation. However, it is pretty obvious even from just the first episode of the series that Bae Doona is the best actor on the show. On the other hand, there could be different reasons why the review was so lackluster. Looking over the show listed, all of the programs listed are available through major streaming sites such as Netflix and Hulu. A considerable amount of content of South Korea and other places in the world are simply unavailable for viewing for the standard viewer. 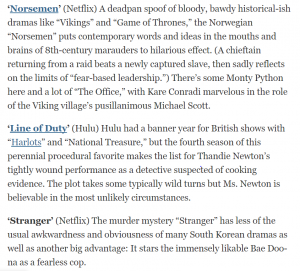 Further, with no other Asian country listed, the reviewers could have seen “Stranger” on the landing page of Netflix with Bae Doona’s name and added it to their list. Eureka! The writer’s opinions are their own and do not reflect the views of Kpoplove.